Most Irish families would have relished the fact that at least one member was in the religious life. A particularly proud moment for an Irish Mammy would be the ordination of her son as a priest. And there would be the requisite celebration. Of course if it happened to be on a Friday, well tradition would also dictate that fish be on the menu. While I don’t have anyone from the “religious orders” in my immediate family, I almost did. The story goes that my mom had unusual means of disciplining us children. Sometimes she would make us go out for a run. Maybe to burn off a little energy? One time, though, my brother and I veered off into an apartment complex with a pool. We just stared into the glistening water. It was a gorgeous sunny California day (like usual) and the cool water was very tempting. My bother happened to be wearing his roller-skates (trying to avoid the dreaded punishment run, he opted to pop on some wheels). And he being the ‘lil devil that he was, dared me to push him in to the pool. And I did. 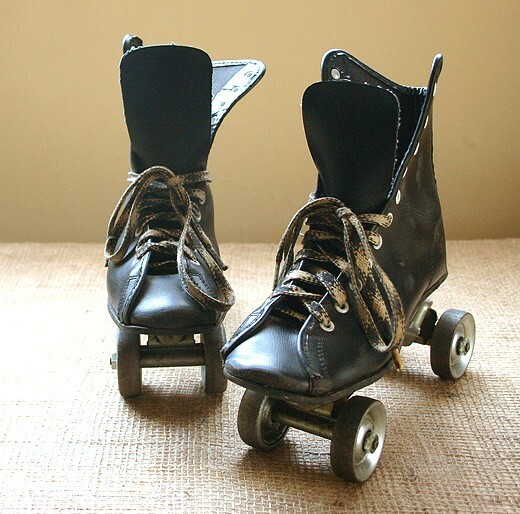 But the old fashioned skates had metal wheels. And so he began to sink. No joke! I screamed for my life, and luckily the residents came to help and he survived. Needless to say, I don’t take people up on dares anymore. So my mom opted that for future disciplinary measures she would separate us. She had my brother run around the block solo (sans skates) and have me run in our backyard. It was actually quite a long and narrow backyard. But one day in particular, I think she forgot I was back there running. My brother had done his stint around the block and was back inside having a cool drink watching cartoons. And because I was obedient, I kept running. And running. And running. I was waiting for her to come outside and say enough was enough. But she never did. This went on for hours. I finally collapsed at the back door and with the little strength left in my eight year old body I reached up and knocked as hard as I could. When she opened the door, she looked down and said, “Oops, I forgot you were still out here”. I could hear my brother snicker a sinister laugh from inside. I suppose it was his way of getting back at me from the near drowning pool incident. So in honor of Father Kenny that was ne’r a figment of my imagination, I am sharing a fish inspired recipe. So at least we can do one thing properly today, by not eating meat on a Friday! It even has a black and white color accompaniment, like clerical clothing. 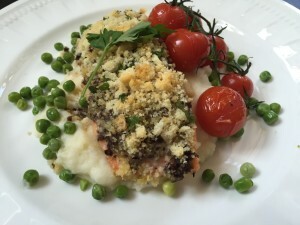 It’s a gorgeous Black Olive Tapenade Crusted Salmon. And to top it all off, today is Ireland’s National Potato Day!!!! Whoo HOO! So I am making a beautiful potato+ cauliflower mash. I call it Potat-iflower Puree! But the secret ingredient is none other than my all time favs, Kerrygold’s Butter and Dubliner Cheese!! And of course my chef’s assistant! I’ll have the demo up on Snapchat (user name blissbakery) if you want to see it. Prepare the Potat-ilower puree by putting potatoes and 2 teaspoons salt in a large heavy saucepan and generously cover with cold water (about 2 1/2 quarts). Bring to a boil, then reduce heat, and simmer, partially covered, until potatoes are tender, 15 to 20 minutes. While potatoes are boiling, heat about 1/3 cup milk and 2 tablespoons butter in a small saucepan until butter is melted and milk is hot but not boiling. Keep warm off heat, covered. 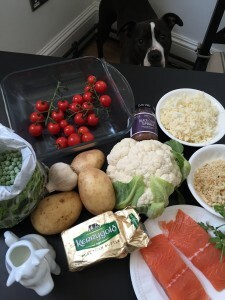 Drain potatoes well in a sieve or colander and return to hot saucepan. Add milk mixture, ½ cup Dubliner Cheese, and pepper, and mash with a potato masher until smooth consistency. Season with salt and keep warm, covered. Drain cauliflower in a colander and pulse with remaining 1/3 cup milk, 1/2 cup Dubliner’s Cheese, and 2 tablespoons butter in a food processor until it’s a purée. Preheat oven to 180 C/350 F. Line baking tray with parchment paper. Place salmon fillets in tray and season with a little salt and freshly ground pepper. 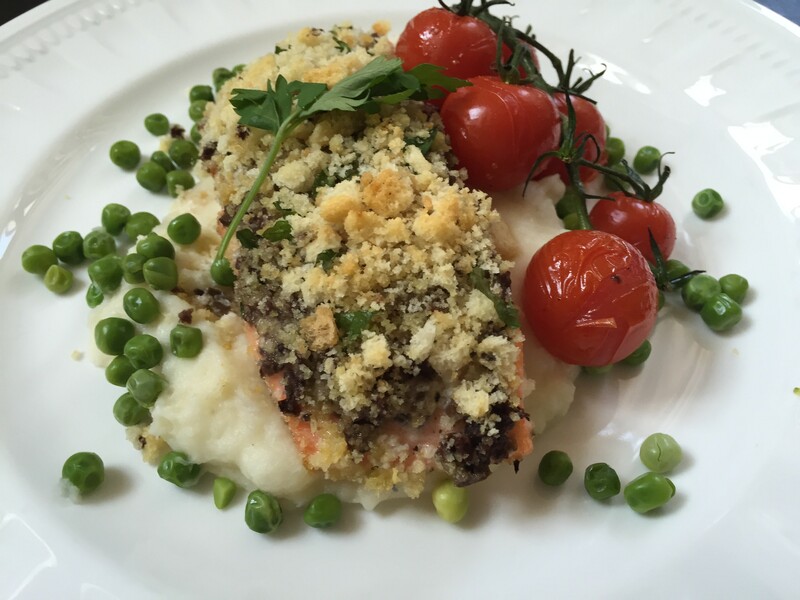 To serve, place a generous scoop of potat-iflower puree on the plate and gently top with the crusted salmon fillet. Garnish with some lovely petite pois and blistered cherry tomatoes. I’m sure we all have funny stories from our childhood. Likely even as adults when we get together we reminisce about them. And this story is our family’s “go-to” and we still tease my brother about his priestly moment in the sun. But I would encourage any of you reading this to actually take time to write your own stories down somewhere, somehow, someday, and someway. It doesn’t have to be a blog like this, but in a notebook, or you can make a video of it. Only today I ran across an old article online about the Importance of Telling Our Stories. Maybe because of my Irishness, but I am excited by stories. The Emerald Isle inhabitants defo have the gift of the gab and have endowed the world with using the tip of the pen to put the wit of its men (and women) onto paper. Other cultures such as the Africans take great pride and pleasure in the tradition of storytelling. However, all of this is getting harder to do so in a society that won’t read anything with more than 140 characters in it (think twitter). So if not for anyone else, do it for yourself. Think of writing your story as entering into your own private confessional! Next > Recipe: No Figgity, No Doubt!